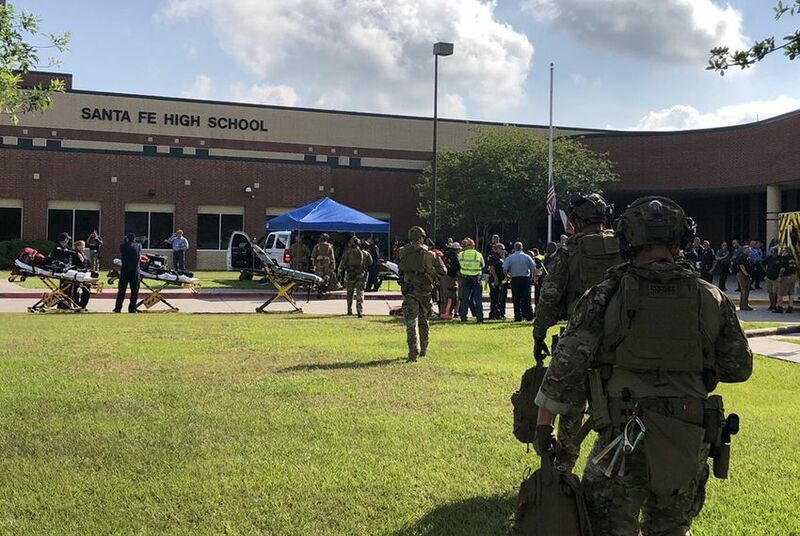 As a recent spate of school shootings has provoked nationwide panic, some advocates and parents are worried school and state officials' response to the May massacre at Santa Fe High School could harm some students more than it protects them. Joanne Tunchez's 15-year-old son forgot to take his ADHD medication one Friday morning in late March. By the end of the day, he had been removed from his South Texas school and arrested for allegedly making a bomb threat in his culinary class. When his teacher asked him to take off his backpack that morning, he told her, “It’s not like it's going to blow up,” according to Tunchez’s later conversations with students who witnessed the incident. Tunchez said the school failed to thoroughly investigate the matter before removing him, violating federally mandated procedures for removing a student with a disability. As a recent spate of school shootings has provoked nationwide panic, some advocates and parents, like Tunchez, are worried school and state officials' response to the May massacre at Santa Fe High School could harm some students more than it protects them. Criminal charges have since been dropped for Tunchez’s son, who has ADHD and anxiety, but he missed more than two weeks of school, spent a couple of days in juvenile detention and failed the state standardized English test required for him to graduate. The state government's response to the heightened fear of school shootings has stemmed from a 40-point list of school safety recommendations released May 30 by Gov. Greg Abbott, compiled after three days of roundtable discussions with teachers, law enforcement, mass shooting survivors and advocates on both sides of the debate over guns. Those recommendations have added fuel to a longstanding debate over how schools should balance classroom safety with the rights of vulnerable students. Advocates for less-punitive disciplinary policies argue the governor’s plan is too focused on “zero-tolerance” discipline and would increase the likelihood that students of color and students with disabilities are kicked out of school and shuttled into the justice system. They fear education policy will swing back toward punitive discipline as educators and lawmakers grasp for immediate solutions to head off violence next school year. "The Legislature has worked to undo some of the harmful discipline policies in practice now. The big fear is what we're seeing is a push to go backward ... and going backward would harm very specific groups of people," said Lauren Rose, director of youth justice policy at Texans Care for Children. Following a national trend, Texas students with disabilities as well as black and Hispanic students are already disproportionately suspended or expelled for misconduct, often removed from school and placed in disciplinary alternative education programs where they are temporarily educated separately from their peers. Past state audits of these programs have shown their limited success in educating kids, increasing the students' likelihood of dropping out once or before they return to their regular campuses. Abbott’s plan includes recommendations to make it easier for teachers to remove students they suspect of violence from their classrooms by adding stalking, cruelty to animals and possession of weapons on school property to the list of offenses that could trigger removal. It also recommends creating systems to address the root causes of students’ misbehavior, including any mental health needs, once they are removed from classrooms. “What’s really concerning is having the state expand any sort of offenses and put a stamp of approval on using [disciplinary programs] as a response to student behavior,” said Morgan Craven, a staff attorney at nonprofit advocacy group Texas Appleseed. She agreed students who misbehave should receive extra counseling and support — but well before they are suspended or expelled. “Zero tolerance doesn’t ask any questions or get to what the issues are. It just says, ‘We’re going to push you away,’” she said. Abbott’s plan also indicates that school districts should follow existing specialized behavior management plans for students in special education who act out because of their disabilities, instead of moving to suspend or expel them, through protections laid out in federal law. Despite the existing federal protections, students with disabilities are overrepresented in disciplinary alternative education programs. In 2016, they made up 16 percent of the programs but just 8.8 percent of the student population. Already, education lawyers are noting more cases where students are removed from school for allegedly making terroristic threats, one of a long list of behaviors that can trigger placement in a disciplinary program. Classroom teachers are more divided on the issue of punitive student discipline, with some arguing that they need more tools to be able to ensure students who put them and other students at risk are not simply left without consequences or help. “We don’t want students being unnecessarily removed from classrooms. ... On the other hand, we don’t want teachers’ hands so tied that they can’t exercise an option allowed in the law to address persistent misbehavior,” said Paige Williams, staff attorney and director of legislation for the Texas Classroom Teachers Association. In 1995, in response to a federal mandate, Texas passed the Safe Schools Act, which required all school districts to provide separate educational settings for students who are suspended or otherwise removed from regular classrooms due to bad behavior. A couple of decades later, with educators leaning on classroom removals and the criminal justice system to deal with classroom management, lawmakers passed a series of laws rolling back zero-tolerance discipline policies and requiring school leaders to consider alternatives to expelling or suspending students. Last year, the Legislature banned out-of-school suspensions for students younger than third grade. With the turn in policy, many teachers are concerned that they are losing their authority over classroom management and that administrators are not taking seriously their concerns over daily acts of student violence, Williams said. “We were hearing a lot of complaints from teachers who were sending students for behavior issues to the principal and there being no consequences once they got to an administrator,” she said. Teachers responding to an informal TCTA survey said lack of administrative support in student discipline issues was a key factor in their decisions to leave the profession, a data point cited in Abbott’s plan. Williams said she has heard from many teachers who were scared for their own safety due to students making perceived terroristic threats, but who had not been taken seriously by administrators or law enforcement. State Sen. John Whitmire, a Houston Democrat, authored a 2015 law that in part requires districts to establish “campus behavior coordinators,” who could be the principal or another school administrator, to determine how best to discipline a student sent to the principal’s office — which would help ensure teachers’ concerns were taken seriously and that students were treated fairly. But more than 150 school districts have exempted themselves from that requirement through a separate 2015 law intended to give districts more flexibility in following state regulations, according to a TCTA count this spring. Police officers placed on campus ended up handling school discipline, giving out tickets to students for minor infractions. Whitmire said he is concerned the current focus on school safety might prompt a reliance on law enforcement. In fact, one of Abbott's proposals was to station more police officers in schools, and districts are already moving forward with such plans. But Rose echoed Whitmire's concerns, saying it would increase the likelihood that teachers and administrators rely on the criminal justice system to deal with behavioral issues. Black and Hispanic students are more likely to be arrested, ticketed and referred to juvenile probation than white students, though they are not more likely to misbehave, according to a 2016 report from Texans Care for Children and Texas Appleseed. “Creating new opportunities to remove students from the classroom is creating more opportunity to socially isolate them and putting students on a path away from success,” Rose said. At a state-sponsored roundtable in late May, family members and survivors of recent school shootings pitched Abbott ideas for what would make them feel more safe in their schools, such as stationing more police officers, making it easier to arm teachers and having students report any suspicious behavior. Many details of Abbott’s plan mirrored the proposals from that conversation, half of which was open to the media. Advocates argue any plans to make schools safer should consider the experiences of a broader group of students. Disclosure: The Texas Classroom Teachers Association and Texas Appleseed have been financial supporters of The Texas Tribune, a nonprofit, nonpartisan news organization that is funded in part by donations from members, foundations and corporate sponsors. Financial supporters play no role in the Tribune's journalism. Find a complete list of them here.